Bruno ran up to Joe and found him unresponsive and not breathing. 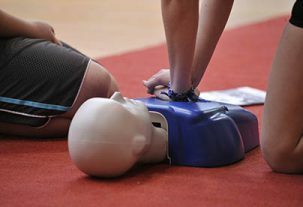 While some of the guys called 911, Bruno started CPR. “I started doing chest compressions. I kept pumping on his chest to keep the oxygen flowing through his body.” “Some of the guys did not react, not because they did not want to, but because they did not know what to do,” tells Bruno. Once the paramedics arrived, Bruno continued the chest compressions until they were ready to take over. Joe regained a pulse after defibrillation, before being transported to the hospital. “Several hours later the doctor came up to me at the hospital and said ‘He is alive because of you’,” shares Bruno, who was very emotional. “Bruno has been a best friend to me for a very long time, but now he’s like a brother,” tells Joe. The ACT High school CPR program was set up in 2008 in Bishop Tonnos Catholic Secondary School where Bruno works as a teacher, thanks to the support of community partner, First Ontario Credit Union, our provincial partners, Government of Ontario, Hydro One and Ontario Trillium Foundation and ACT’s national health partners, AstraZeneca Canada, Sanofi Canada and Amgen Canada.